The weather is finally warm after what seemed like an endless winter. The minute you put your flip flops on, the pace of life gets slower and the living gets easy—including picnics and potlucks. Simply pick a theme from these ten ideas and head over to SignUp.com to handle all of the details! 1. Ice Cream Social – Stock up on a variety of flavors, or have your guests sign up to bring their favorites. Don’t forget the toppings! 2. Summer Movie Night – If you’ve got a projector, set up lawn chairs for the adults and throw blankets on the ground for the kids for an outdoor movie night. Consider renting an old-fashioned popcorn maker, and serving typical drive-in movie fare. 3. Star Gazing – Another outdoor viewing party, but no need for a projector for this one! Time this to coincide with a meteor shower or eclipse and serve star and planet themed food and drinks. 4. Mexican Fiesta – Celebrate Cinco de Mayo with a Mexican taco bar and a margarita machine! 5. Dessert Buffet – Have participants sign up to bring their favorite desserts in miniature form, creating decadent finger food. 6. Wine Tasting – Have guests bring a bottle of their favorite wine and their favorite appetizer to pair with it. 7. Under the Sea or Beach – If you can’t take all your friends to the beach, bring the beach to them! Decorate with sand and shells and candles inside hurricane glasses. Have guests sign up to bring their favorite beach-related food and turn up the Beach Boys! 8. Luau – An exotic twist on a summer party, traditional luaus are potluck affairs with each family invited responsible for bringing a signature dish. Decorate with grass skirts, fresh flowers and serve drinks in coconut husks. Don’t forget the tiny umbrellas! 9. Hot Dog/Burger Bar – This July 4th, what could be more American than a burger/hot dog buffet. Do the grilling ahead of time and have guests bring side dishes and fixins. 10. Neighborhood Block Party – You’ve been meaning to do it forever, but why not take advantage of the nice weather to get to know your neighbors? Call the city to arrange to block off your street, set up long tables to hold food and drinks, and crank the tunes! At SignUp.com, we’ve got everything you need to organize a potluck dinner or picnic right at your fingertips. 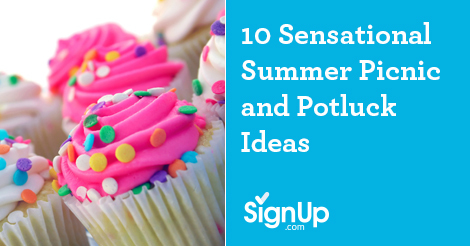 With easy potluck SignUp sheets, event reminders and checklists, all of the details for your next potluck are handled and you can concentrate on the other fun details, like choosing a theme. Participants sign up with the dish they are contributing, and are notified via automatic reminders -- which means you’re not making endless follow-up phone calls or trying to keep track of a dozen "reply all" email threads. Participants can sign up 24/7 from their smart phones and computers and even sync their commitment to their eCalendars! For more potluck ideas, do’s and don’ts watch our potluck video and visit our Potluck Station!